So often it’s hard to know how to help friends who are having mental health problems. Marja’s book offers a way. 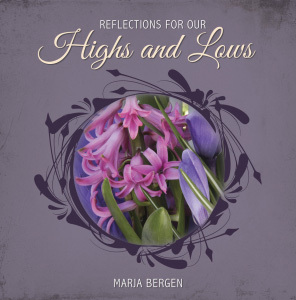 Reflections for our Highs and Lows, richly illustrated with colour photographs, makes an ideal gift. When she began to write these twenty-eight devotionals she had people in mind who were suffering in this way. However, the thoughts she expresses are words of truth for everyone, no matter what they are experiencing in life. 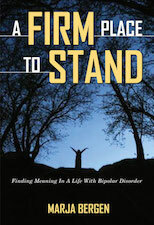 Marja brings an understanding to her writing that comes from having lived with bipolar disorder since 1965. In the book Marja reflects on Bible verses, using stories and experiences from her own life and other people’s lives. Readers can see God’s Word come alive and learn to survive and thrive as they put their trust in God. Marja’s passion is to comfort, encourage, and inspire as she shares her reflections. 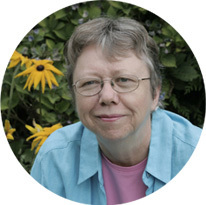 Marja Bergen, long-time mental health activist and founder of Living Room Mood Disorder Support Ministry has authored two books before this one: Riding the Roller Coaster (1999) and A Firm Place to Stand (2008). Having lived with bipolar disorder since 1965, she writes from a place of understanding and compassion.